Os agressores não podem ser perdoados!!! Mais uma bela peça da retórica norte-coreana! Confesso que estou me divertindo com isso! Façamos figa para que o democrático regime de Pyong Yang seja preservado! (Afinal, já perdi Kadafi, Chávez, Chico Cézar (Kim Jong-il, o pai de Bob Filho), e Berlusconi… o mundo está ficando sem graça…). 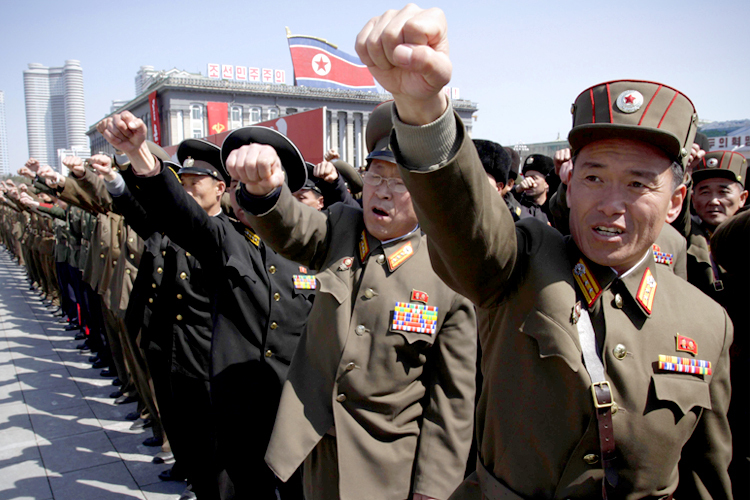 Pyongyang, April 5 (KCNA) — The decisive battle with the U.S. imperialists and their followers will be a patriotic sacred war of justice based on the truth that the DPRK cannot co-exist with the aggressors keen on bringing it down and daring hurt the supreme dignity, the whole of the life and soul of its army and people. Minju Joson Friday says this in a bylined commentary. The U.S. has persisted in its moves to ignite a war against the DPRK for over 60 years after suffering a bitter defeat in the June 25 Korean war started by it to stifle the DPRK in its cradle. The U.S. is pushing forward in the practical phase the moves for unleashing a nuclear war against the DPRK, taking issue with it over its satellite launch for peaceful purposes and nuclear test for self-defence. The south Korean puppet forces are daring hurt the national treasure of Songun Korea, a crystal of the profound reverence and pure loyalty of all its service personnel and people. How we can co-exist with the U.S. and its followers keen on the moves to stifle the DPRK by force of arms while hurting the dignity of its supreme leadership? Very just is the judgment and decision of the Supreme Command of the Korean People’s Army that time has gone when words worked on the U.S. and its followers and they should be wiped out only with the arms of Songun. That is why all service personnel and people of the DPRK have turned out in the decisive battle to win the final victory in the all-out action against the U.S. in our generation, true to the important decision of the dear respected Marshal Kim Jong Un. They will give vent to their pent-up grudge and realize cherished desire in the decisive battle of justice to reunify the country and certainly build the most powerful country on this land. Esse post foi publicado em Coréia do Norte, EUA, Guerra e marcado ameaca coreia, conflito coreia, Coreia, Coreias, crise coreia, guerra Coreia, Kim il un, Kim Jong Il, peninsula coreana, Pyong Yang, Pyongyang, Seul, tensao coreia por Joanisval. Guardar link permanente.